Are you in search of powerful excavators for your most demanding bulk earthmoving and heavy lifting applications? Caterpillar® is a manufacturer of the world’s most innovative earthmoving machines for nearly a century. We offer a line of medium and large excavators that is up to the challenge. These robust, hard-working machines feature advanced hydraulic systems that deliver superior digging capacity, allowing you to complete your projects with greater speed and efficiency. You will also appreciate how easy Cat® excavators are to operate, as well as the energy-efficient engines that will reduce your fuel costs. 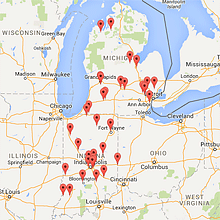 Call us today at (317) 803-2526 for more info on excavator rentals. Looking for smaller excavator rentals? Visit MacAllister Rentals for mini and small excavators. 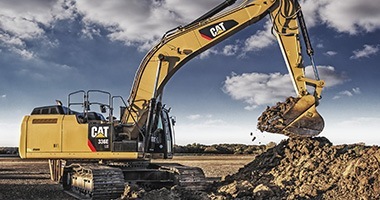 If you’d like to add a Cat excavator or two to your heavy equipment fleet in Indiana but don’t want to make a significant long-term investment, consider an excavator rental from MacAllister Machinery. At MacAllister Machinery — an authorized Cat equipment dealer since 1945 — we’re able to offer an extensive selection of track excavator rental models from Caterpillar that will meet your requirements on a short-term or long-term basis. You’ll find an assortment of medium and large excavator rentals that will allow you to make the perfect match between machine and application. When Does an Excavator Rental Make Sense for Your Company? Renting a medium or large excavator will allow you to replace a machine that’s in the shop for repairs or temporarily unavailable for other reasons — with our fast service, you’ll be able to keep the project on schedule. If you’re experiencing a sudden upturn in business, renting gives you a cost-effective way to bolster your fleet and meet the demand. Renting also helps you avoid the draining of resources that may accompany a purchase — you won’t have to make a significant capital investment. A medium or large excavator rental from MacAllister Machinery comes with more than 70 years of heavy equipment expertise and a sincere commitment to providing world-class customer service. Achieving total client satisfaction has been the goal of our company from the very beginning. Please take a minute to explore our heavy rental product guide, where you’ll find all our excavator options. You can also give us a call or contact us online for more information and a no-obligation quote.